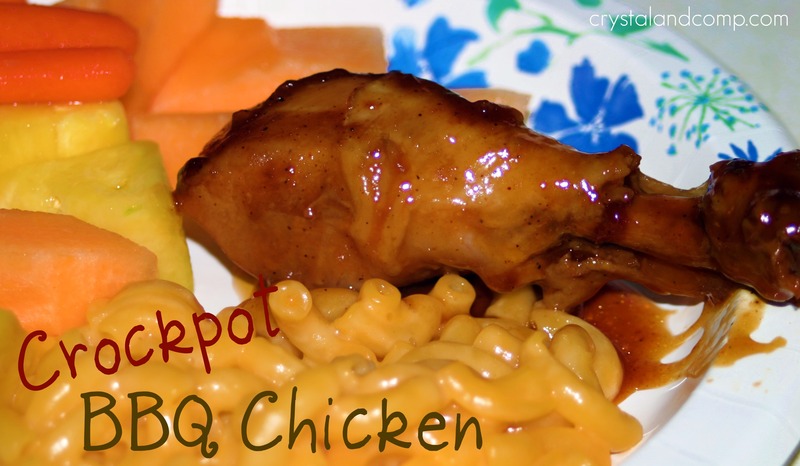 A few months back my friend Kim shared a crockpot secret with me. A solution I had not thought of. She told me she makes BBQ in the crockpot all the time. So I tried it. Totally simple. My children devoured it. And now it is a regular on my weekly meal plan. And in the summer with all the Texas heat, this is a great way to enjoy a delicious summery food without heating up the oven. Brace yourself. This is beyond simple. And like most of the recipes I share here, this doubles easily when feeding a large family. 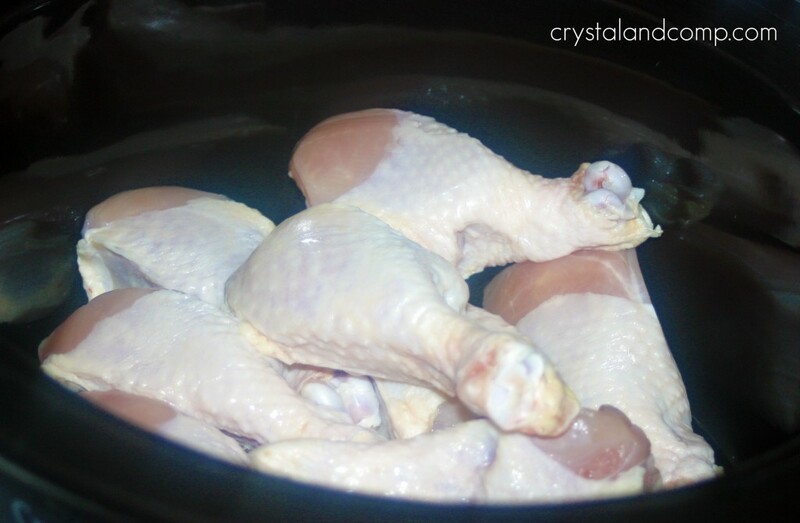 Place your uncooked chicken in the crockpot. Cover the chicken in your favorite BBQ sauce. I even add a little bit of water to the container to get the last of the remnants out. There is really no need to smear each piece of chicken with the sauce. As it cooks, it all gets coated. Put the lid on it and cook on high for 4-6 hours or on low for 8-10. When it is done, this is how your chicken will look. My kids like mac and cheese with their BBQ chicken. Throw in some fresh cut pineapple, some carrot sticks and cantaloupe cubes and you have a winner! Perfect summer food without heating up the kitchen! We like to serve this with mac and cheese and fresh fruit. A nice dinner salad goes lovely with this recipe as well. 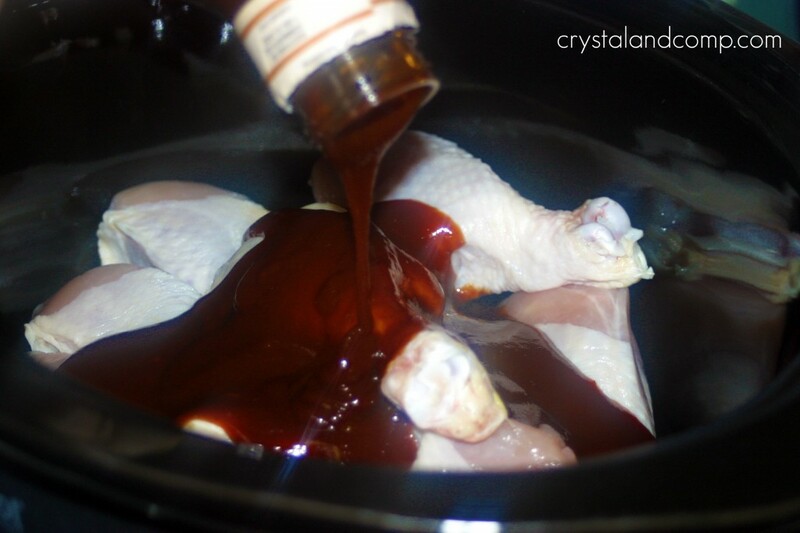 Cover the chicken in your favorite BBQ sauce.I even add a little bit of water to the container to get the last of the remnants out. This is a recipe that doubles very easily which is perfect for large families or someone wanting to batch cook. I made it last Tuesday and as always my family ate the entire pot! I’m going to have to try your version now! I just did this the other day and I even used a bag of frozen chicken legs. It was fantastic! So easy and simple. I found you at TT & J’s party. This looks delicious! I was looking for an easy recipe to make for Sunday dinner and this is perfect! Thanks! What a great “cool”, as in don’t heat up the kitchen, recipe. I just love to have a recipe like this to help out on these hot days. Hope you are having a great week end and thanks for sharing with Full Plate Thursday. Looks good! I like that you use legs instead of breasts. I find breasts always dry out in the crock pot. This looks AMAZING! I would LOVE it if you shared this recipe with us at Cast Party Wednesday tomorrow! I have been looking for great crockpot recipes. I will have to try this. Great idea! 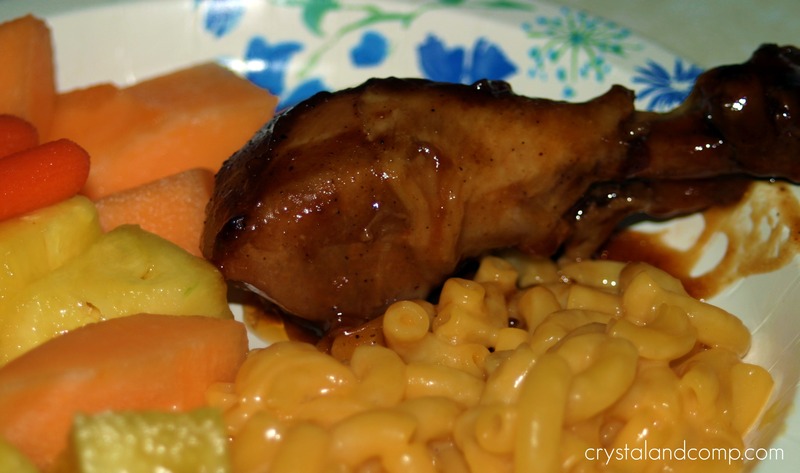 My kids love drumsticks (“chicken with a handle” at our house!). I have also done this with pork chops and BBQ sauce, then “pulled” the meat with two forks and served on buns. Ya gotta love a two-ingredient recipe! Yum, yum! These are my favorite kind of recipes, simple and delicious! I’m gong to be trying this for sure. I’m your newest follower! did you know i love my crock pot? no really…its my favorite thing ever! i hope you will link up with me here! Your chicken pics really do make me drool! Thank you so much for linking up at Savvy HomeMade Monday. I hope you will party again tomorrow!